ICE Enforcement and Removal Operations made a total of 143,470 arrests in fiscal 2017, a 30% rise from fiscal 2016. 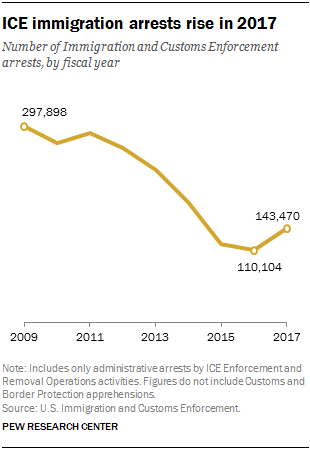 The surge began after President Donald Trump took office in late January: From his Jan. 20 inauguration to the end of the fiscal year on Sept. 30, ICE made 110,568 arrests, 42% more than in the same time period in 2016. ICE reports arrests geographically by “areas of responsibility.” Although they are named for field offices in major cities, these areas can encompass large regions of the U.S., with some covering four or more states. 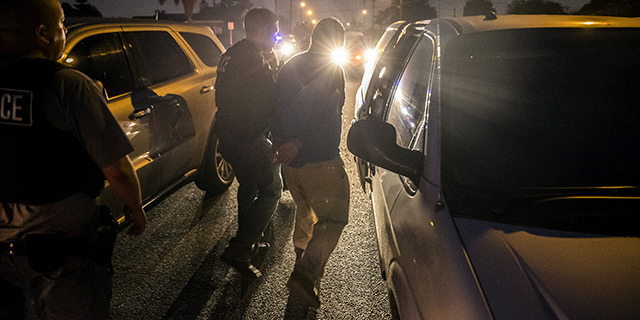 The Miami area of responsibility, which covers all of Florida, Puerto Rico and the U.S. Virgin Islands, saw the largest percentage increase in ICE arrests between 2016 and 2017 (76%). Next were the Dallas and St. Paul regions (up 71% and 67%, respectively). Arrests increased by more than 50% in the New Orleans, Atlanta, Boston and Detroit regions as well. Note: This post and accompanying map have been updated to clarify that outlying U.S. territories are covered by areas of responsibility.